Can you believe it? The Oregon Ducks, the team that was projected to be one of the worst in the Pac-12 Conference this year, just played a game in the Big Dance. That alone is an accomplishment by itself! 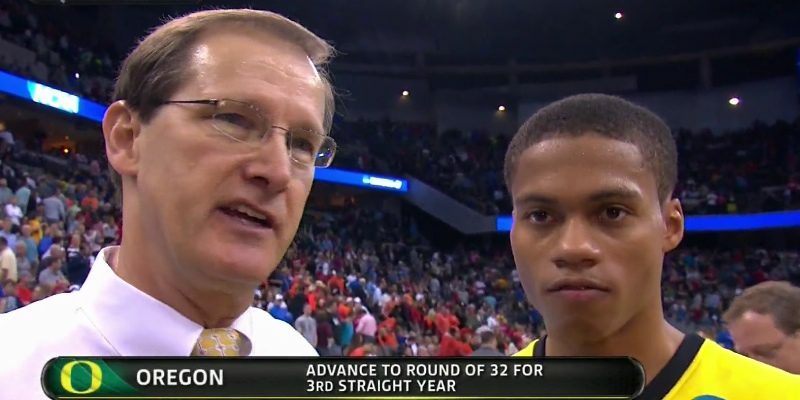 But, knowing Coach Dana Altman, we knew that just being there wasn’t enough for this hungry squad. The Ducks took on the Oklahoma State Cowboys tonight in a thrilling battle to the end. Both teams started off a little shaky, understandably since this was their first game of the big tournament. However, they quickly began to cash in, matching each other’s scoring shot-for-shot. It was no secret that if the Ducks were to be successful in this tournament, Joseph Young was going to have to play his tail off, and he did. The scoring threat point guard led all scorers with 17 points on 3-4 from beyond the arc, while getting a few guys involved with three assists. There was no doubt that this was the Joseph Young show in the first half. With Young dominating the Cowboys single handedly, plays opened up for guys like Dillion Brooks and Elgin Cook as they contributed 11 and 9 points respectively. The Ducks played a man-to-man defense against Oklahoma State, since they were a bit more athletic than the Cowboys. Oklahoma State continuously jacked up three after three in the first half, shooting a dismal 28.6% from three. Coach Altman had this team scouted well, and the Ducks showed they were prepared in the first half. 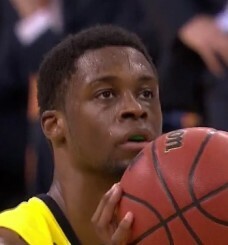 Oregon shot 50% from the field to the Cowboys’ 45.5%. Both teams did a good job on the boards, but the Ducks won the first half with a score of 43-39. 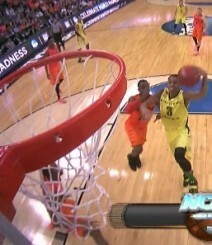 Oklahoma State knew that if it had a chance at winning this one, it needed to stop the Duck’s catalyst in Young. But man, is that a difficult task to ask of your players if you’re the coach of the Cowboys. Saying something and doing something are two totally different things. Joe Young, he DOES what he needs to do. The second half was just as much of a battle as the first. The teams went back and forth in what seemed to be non-stop action and running. Thankfully, the Ducks are one of the best conditioned teams in the nation, and that’s what really won them the game tonight. Joseph Young had a monster dunk in the second half that shook the entire arena! 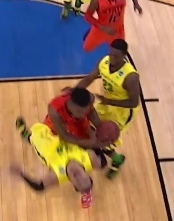 As soon as he bashed it right over the Oklahoma State player, it was obvious that the Ducks were serious. I’ve never seen Joseph Young perform with such confidence in my life. He had the eye of the tiger undoubtedly. Although the Ducks were on the attack, and it seemed the Ducks were playing at such a high level, Oklahoma State continued to fight and stay in it. It came down to the last few minutes of the game, but Young and the team held their own in the 79-73 win. Cook finished with 18 points, 5 rebounds, and three assists, which was crucial for the Ducks’ success. Young ended up with 27 points on 8-15 shooting. With the Ducks coming together and working so well together, they’ll be difficult to stop… if they can get past Wisconsin in the next round, that is. Dillon Brooks takes a charge! Taking on Wisconsin is going to be the most difficult task the Ducks have faced this year. But, it’s not going to impossible. If the Ducks can run them, then they’ll have a chance. They can’t allow Wisconsin’s big men to to get set and and work in the paint. If forced to run, they’ll get tired and have to work much harder to get their points. Not only that, but Joseph Young is going to have to drop at least 35 points to win that game. The team’s performance is based on Young’s success. It’s unfortunate that the Ducks don’t have a true point guard, because it would make it much easier for Young to get shots up off the screen if someone were setting him up. But, they have what they have, and Joseph Young is still the Pac-12 player of the year. Hopefully, the Ducks don’t shy away from their true potential. Oregon simply needs to play Ducks basketball to have a chance at this one.